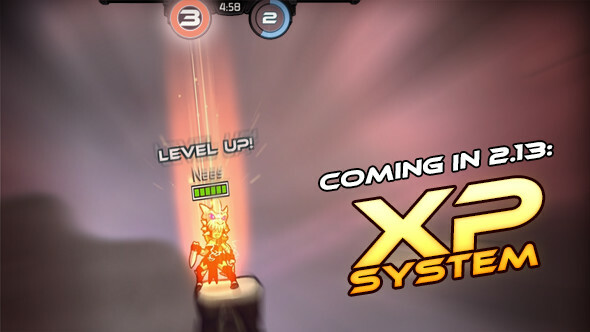 Coming in 2.13: an XP system! 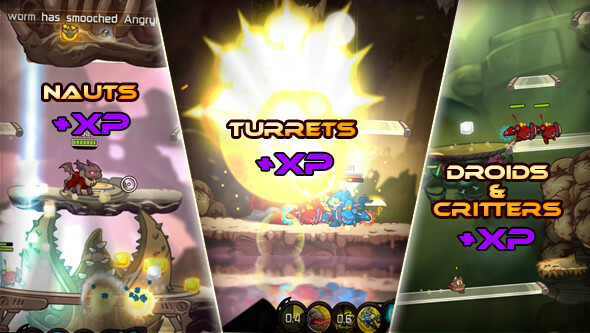 For the upcoming update we’ve been working on a massive new gameplay feature for Awesomenauts: an XP (experience points) system! Since the launch of the game we’ve always had a single system for improving characters during a match: buying upgrades. And while it’s a very fun system that has a lot of flexibility, we feel we can take the game even further by adding an XP system. While the game will play almost exactly the same way you know and love, the flow of battle will change in various subtle but significant ways. Stalling and overly defensive play will be less effective, comebacks are more likely but will require a more proactive playstyle and item builds will get more variety. If you want to know how this will be achieved in more detail, check out this forum post. The system itself is very simple: if an enemy turret, Awesomenaut or droid/critter goes down, your team gets XP! Once a certain threshold is reached, your team will level up! When you level up, your health and damage will increase by a set percentage. We’ve already playtested the system internally, and invited local community members to take a hard look at it. The response so far has been very positive, and we’re very excited about the potential this system has for the game! Still, to make sure this system reaches that potential we will need help finding bugs and balance issues. That’s why we decided to make the upcoming beta for 2.13 open for everyone! So once the beta goes live next week, give it a thorough playthrough and please tell us what you think!